Not exactly a grand gesture of confidence: some of the US Air Force's airmen, the world's most elite, want nothing to do with the Air Force's "elite" new fighter. Why? Because the only people it's threatening are its own pilots. Gen. Mike Hostage, commander of Air Combat Command at Langley Air Force Base in Hampton, Va., told reporters that a "very small" number of pilots have asked not to fly the fifth-generation fighter jets or to be reassigned. We can probably assume that if the problem is so bad that the USAF has to cop to it, it's more than a "very small" number. And can anyone blame them? 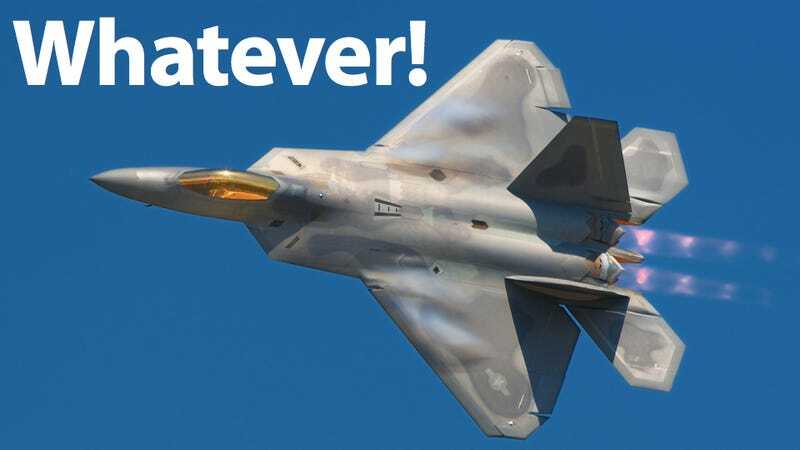 The F-22 has been grounded and un-grounded to the point of losing count, the Air Force has essentially thrown up its hands and said "Whatever, man!" when it comes to the plane's oxygen system defects, it's responsible for a pilot death, which was then blamed on his own error, not vastly documented mechanical problems.